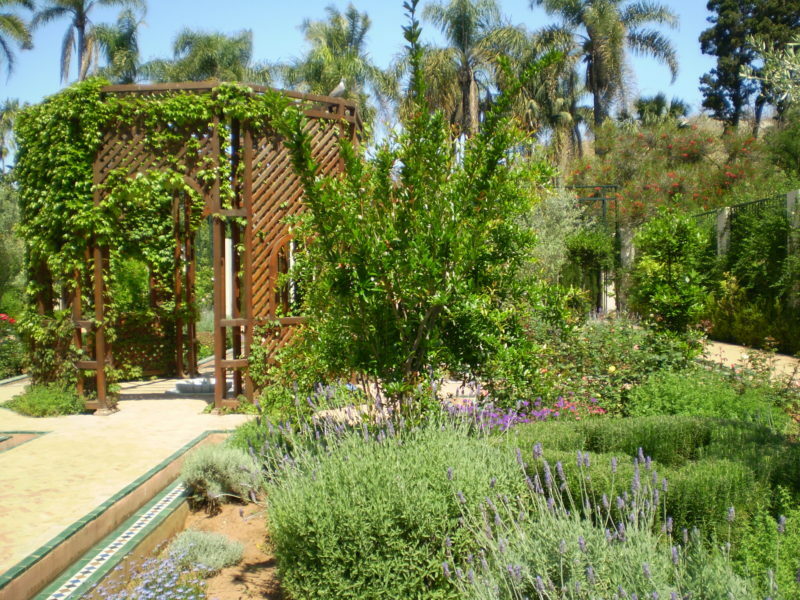 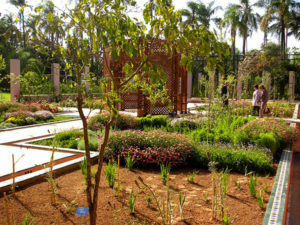 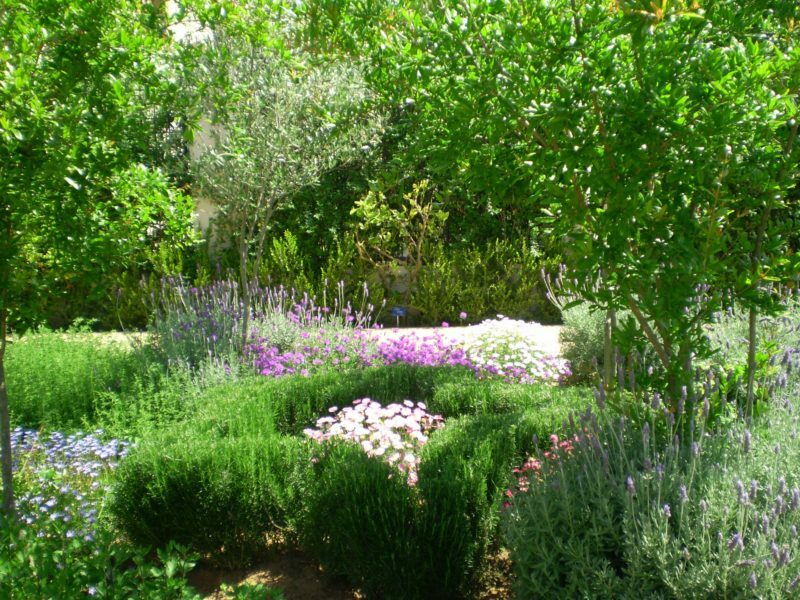 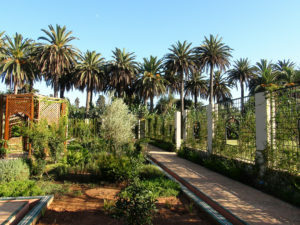 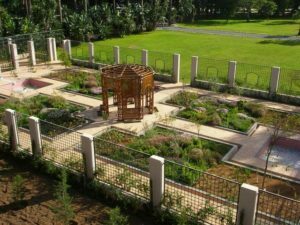 In 2009 Islamic Culture Foundation (FUNCI), within the Med-O-Med Program, in collaboration with the INRA (Institut National de la Recherche Agronomique) and the Wilaya of Rabat-Salé-Zemmour-Zaër, started developing an andalusi inspired garden as part of the offer of the Jardin d’Essais Botaniques (JEB) of Rabat, a recently restored 16 hectare historic space conceived at the beginning of the 20th century by Jean Claude Nicolas Forestier. In addition to considering an andalusi style garden and restoring a neo Moorish pavilion, FUNCI has collaborated in the rehabilitation of the JEB by assessing the landscaping and the botanical collections. 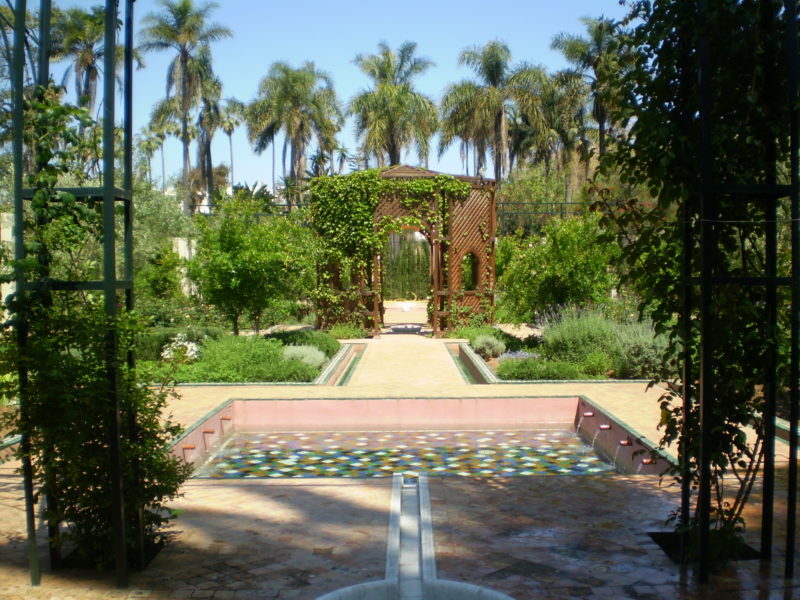 The andalusí garden, which has been made on the Northern area of JEB, is not a copy of any specific garden. It is a synthesis, with some Almohad influences, of the stylistic, philosophical and scientific meaning of a garden of the time of Al-Andalus. 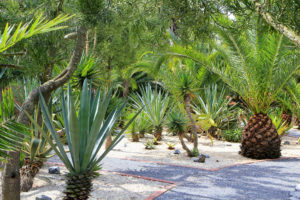 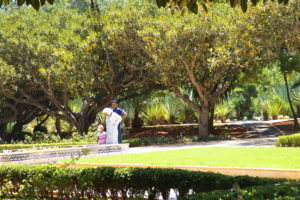 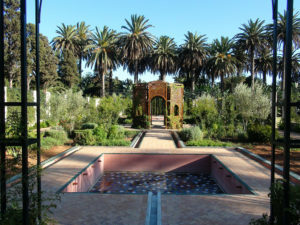 The garden has been made within one of the large sites of the Jardin d’Essais Botaniques, next to the neo Moorish recreational pavilion from the early 20th century. 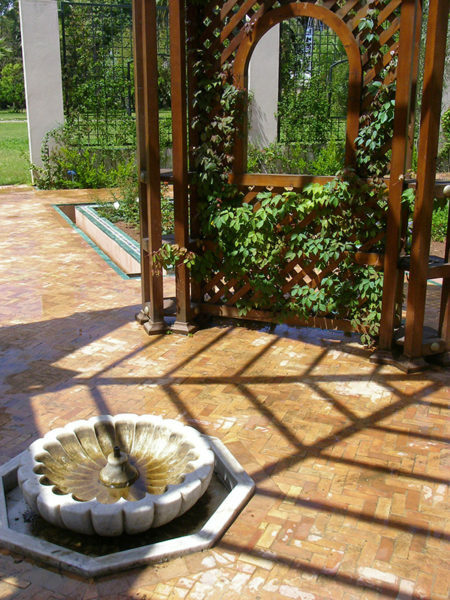 The pavilion has been restored by FUNCI within the Med-O-Med Program and the idea is to generate a setting for study and spreading of culture, a showcase garden of andalusi space concepts, water and plant use. The site would also have a vegetable garden where the common al-Andalus species would be grown, including vegetables, fruits and other plants to which economic and decorative uses were given. Thus, the practical and sensorial and spiritual duality present in andalusi cultivated areas and gardens have been recreated, as told by agricultural and poetic texts of the time. 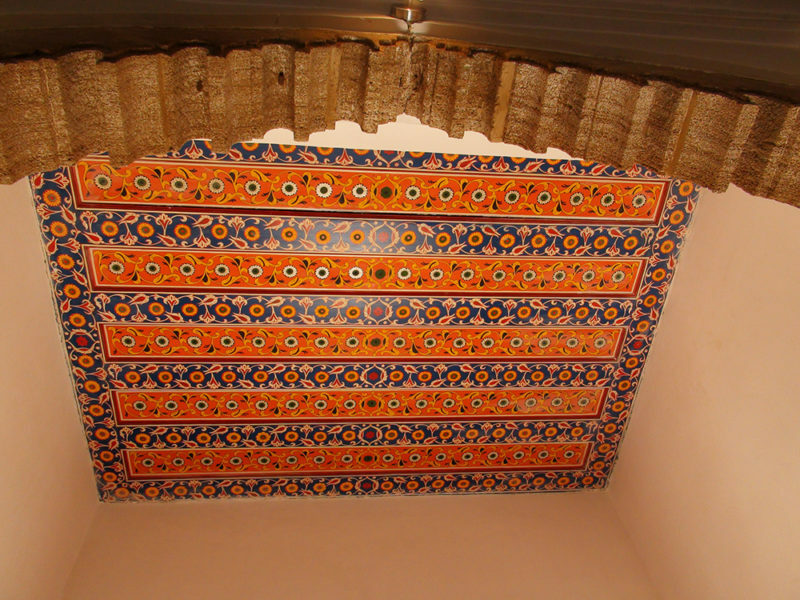 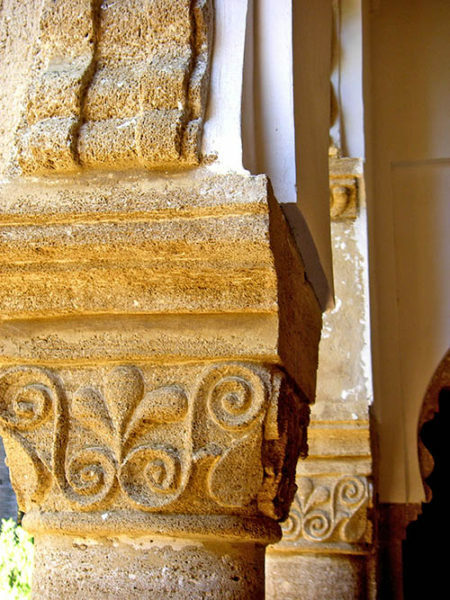 The architect, Antonio Almagro, from School of Arabic Studies (CSIC) of Granada and the agricultural engineer, Esteban J. Hernández, from the University of Cordoba have done the Project. 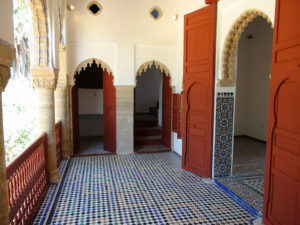 Faisal Cherradi and Néstor Martínez, from FUNCI (Islamic Culture Foudation), have collaborated in the Managment Direction. 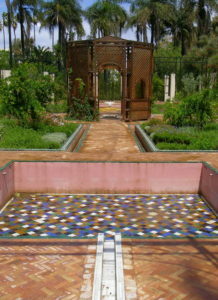 It is a cross-shape garden with water reservoirs at the ends, basin fountains with springs, watering lines around the perimeter of the lawns, central arbour with a plant pavilion and plant pergolas and arches. This closed type of patio-garden, in line with the hortus conclusus of Semitic tradition, has been the accepted choice as it is the most representative of al-Andalus gardens and because it creates an intimate environment with respect to the larger and lush Jardin d’Essais, which tends to minimize any new introduction. 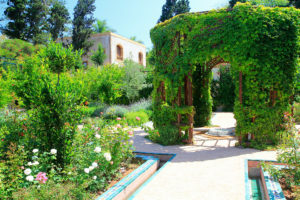 The simulated architectural setting that borders the garden has mainly been done with plants that define spaces inspired on those of an andalusi house or palace. 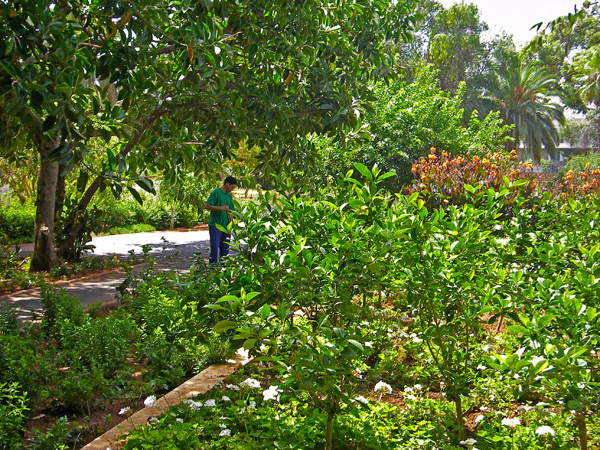 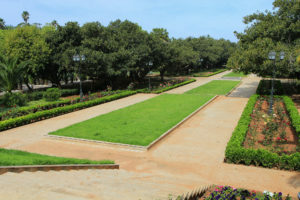 The 50 meter long by 20 meter wide garden is rectangular in shape and is North-South oriented. 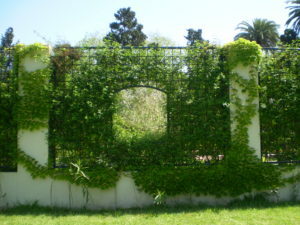 At the far ends it has resting areas with benches enclosed by plant wall-like elements made by cypresses and climbing shrubs that grow up light pillar structures and metal nets, simulating rooms of a house. 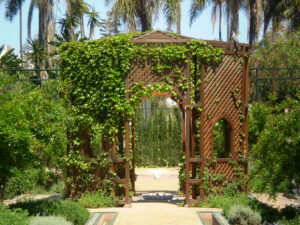 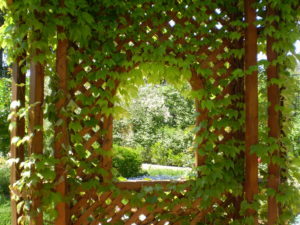 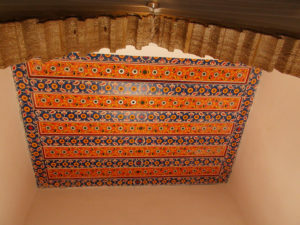 The sites of the resting areas, which simulate relaxation rooms of a house, have pergolas that create shady spots where comfortable benches are placed. Opposite these areas are lobby-type porches made of rambling plants, mainly rosebushes, which grow up metal structures. 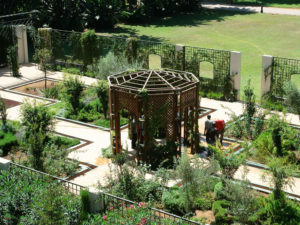 A small square plaza has been made in the centre of the cross-section with an arbour made of wooden latticework and benches placed within. The watering system is that used traditionally in medieval gardens and vegetable gardens. 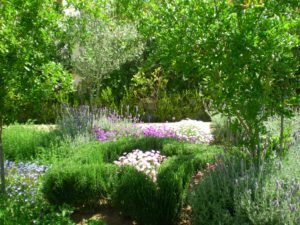 Lawns are watered using surface or flood irrigation systems, making canals, basins and fountains functional as well as decorative. Lemon trees enclose the Myrtus tree hedge that surrounds the gardens. 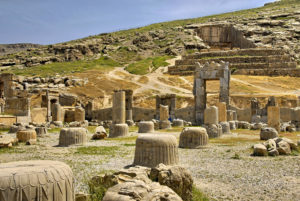 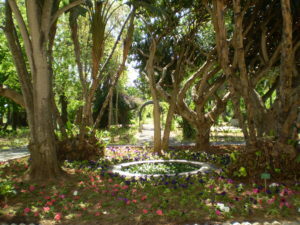 The common line of fruit trees in the hipanic-islamic patios was made here using olive trees. 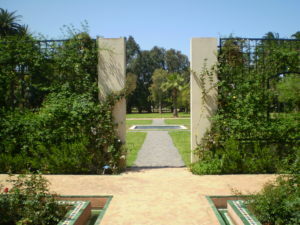 There are several pomegranate trees, bitter orange trees and Judas trees surrounding the central reed arbour. 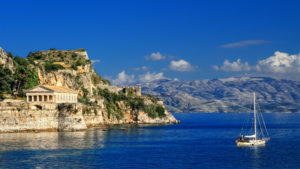 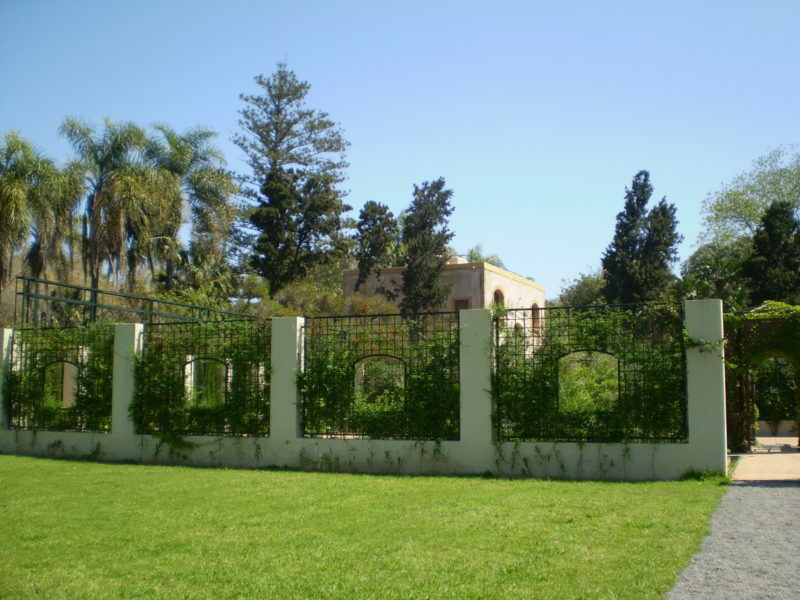 Next to it has been restored an old-style neomorisco recreation pavilion , probably built in the nineteenth century and later renovated in one of its facade at the French protectorate following Western standards. It has three floors. 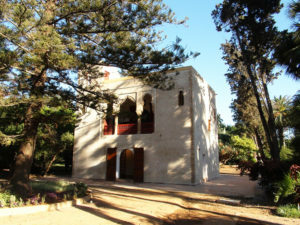 North facade shows typical Moroccan architecture, with an arched covered balcony with poly lobed sandstone arches, while the South shows large holes and European-style windows, no doubt designed to let in light and sun. 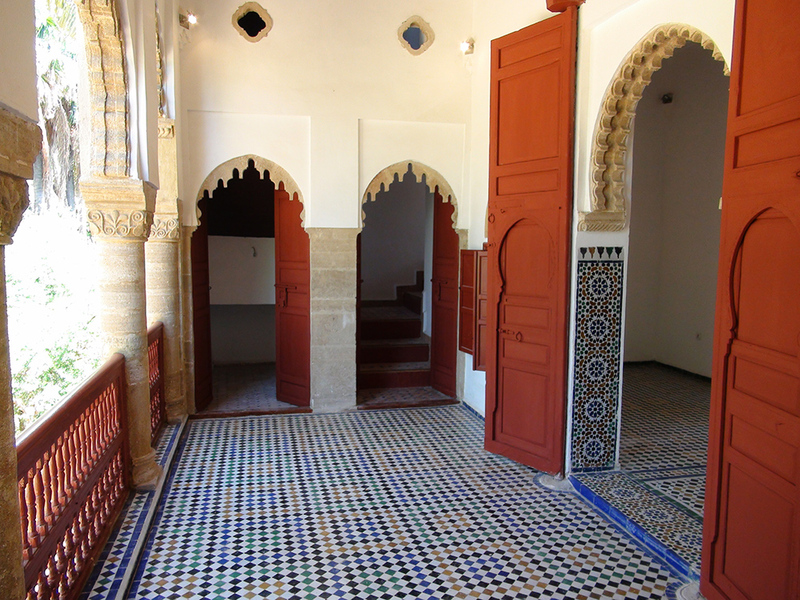 The interior consists of small rooms and and bedrooms, with a reception room on the top level, floored with traditional tiles and topped by a coffered ceiling of cedar wood. 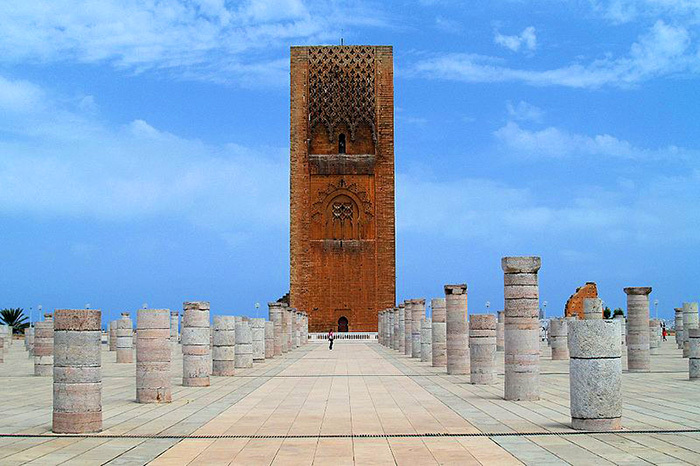 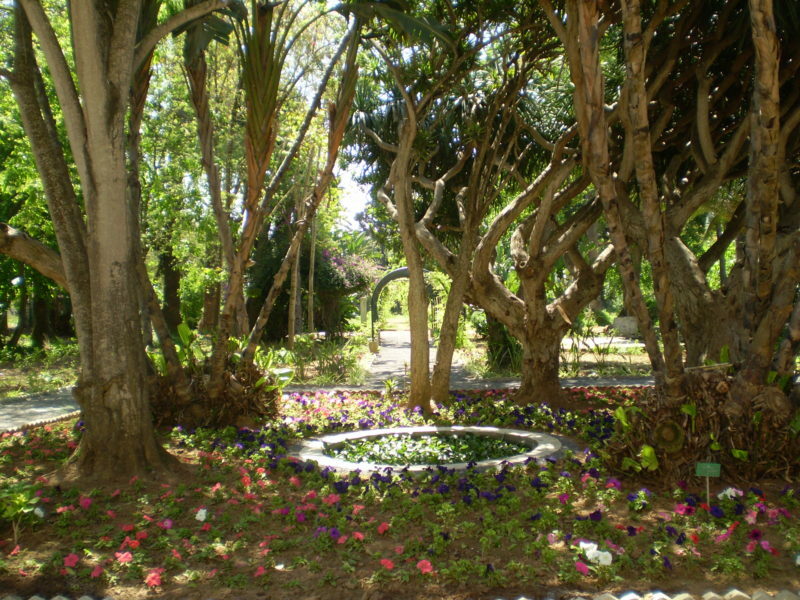 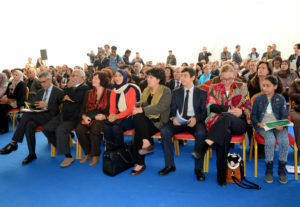 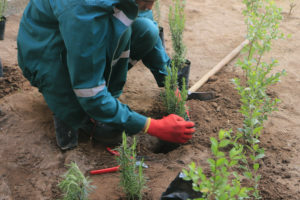 The rehabilitation of the Jardin d´Essais in Rabat carries on. It is a 17 hectares garden, conceived by Jean Nicolas Forestier in the begining of the twentieth century. Med-O-Med has contributed through botanical and landscaping advice, as well as the creation of an andalusi style garden and the rehabilitation of a neo morisco pavilion for cultural activities. 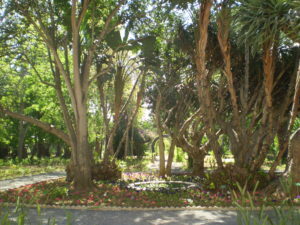 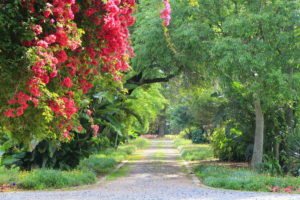 The Botanic garden in Rabat (JEB), is at the moment in growing and flowering time, as it can be appreciated in the photographs below. The garden will be inaugurated soon together with an exhibition about water in Al-Andalus, opened to general public.